After years abroad, Lord Daniel Bryant has come home to face his evil twin, find out who tried to kill him ten years ago, and uncover the meaning of a cryptic note from his late father’s solicitor. Of all the surprises that await him, none are more shocking than his brother’s fiancée throwing herself at him. When they were younger, Daniel cared for Julia. His affection for her quickly turns into more upon meeting her again. Daniel knows he cannot let Julia marry Edmund, but if he claims her for her own, she might be caught in the crosshairs when Daniel’s unknown enemy attacks. A dashing hero, a spirited heroine, and a crazed assailant make The Heart of a Duke a lively tale. 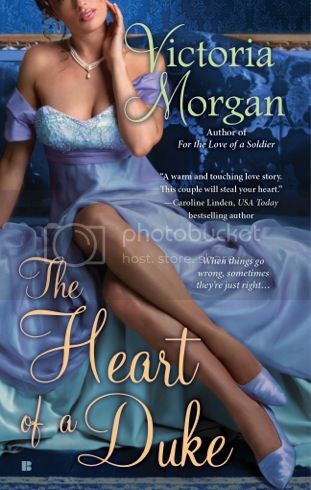 Victoria Morgan charms readers with her delightful characters even as the story suffers somewhat from extreme predictability. It’s impossible not to like Daniel and Julia, and their romance is both sweet and quietly sensual. Where The Heart of a Duke falls short for me is in the mystery plotline. The answers Daniel returns to England to seek seemed glaringly obvious to me and every twist the story took was so blatantly choreographed that I was left feeling disappointed. As for the story’s villain, sadly Edmund was a maniacal black-hatted type, and I truly wished there had been some shades of grey to his character. Julia’s family and Daniel’s friends add sparkle to The Heart of a Duke, particularly handsome American Brett and Julia’s sister, Emily. The chemistry between Brett and Emily left me hungry for more, and I dearly hope that Ms. Morgan plans to write a story for these two. If I hadn’t been able to foresee the book’s climax from the beginning, I think I would have adored The Heart of a Duke. As it stands, I did like romance and the tale’s good guys had me smiling more often than not. If Ms. Morgan writes a book for Emily and Brett, I’ll definitely be first in line to buy it.